Guy Jean-Louis and Velina Kozareva, Class of 2016, joined the journal as freshman, drawn to a loud red banner labeled “THURJ” at the Student Activities Fair. 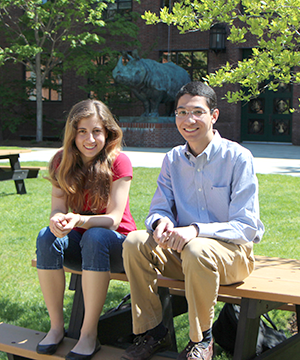 Now Co-Executive Editors, Jean-Louis and Kozareva (MCB and Biomedical Engineering concentrators, respectively), are both passionate about writing and research, and oversee a large organization of peers who feel the same. Funded in part by Harvard Catalyst and supported by a Faculty Advisory Board including MCB Professors Guido Guidotti and Rich Losick, The Harvard Undergraduate Research Journal, boldly abbreviated “THURJ,” is just that: peer-reviewed undergraduate research published by undergraduates for undergraduates—and for the Harvard research community at large. “Our goal,” says Jean-Louis, “is to promote research among undergraduates both at Harvard and beyond by publishing their work.” Each issue—published bi-annually both in print and online—features five research papers, the cream at the top of a pile of submitted manuscripts selected by undergraduates on THURJ’s Peer Review Board and reviewed by Harvard graduate students, postdocs, and faculty. This selection consistently “demonstrates the diverse range of disciplines that students are studying here at Harvard,” says Kozareva; “We cover everything from foreign affairs to neurobiology to linguistics.” Accordingly, this Spring’s “Best Manuscript” winner, rising Sophomore Amanda Fang, tackled Myanmar’s Foreign Policy from 1988-2012, while her peers took on human physiology, child psychology, and public health implementation. Behind the leading research papers, the magazine’s “Features” section offers wide-ranging original content, such as a report on the Mars MESSENGER mission, a tribute to the science and tradition of beer, or an interview with Guido Guidotti. Now in its seventh year, THURJ is continuing to expand, and aspires to increase its readership by developing its online presence. The attractive and accessible THURJ website boasts web-exclusive content and the THURJ blog, which Kozareva and Jean-Louis hope will continue to encourage readers to comment on papers and articles online. As a student organization, THURJ contributes its fair share to undergraduate enrichment and treasures both submissions (offering a $500 award for Best Manuscript) and the staff members who volunteer countless hours of their time to crank out each issue. However, according to its leadership, THURJ exists to benefit its readers as much as or even more than the individuals behind the scenes or on the front page. Support THURJ by reading THURJ online! Email contact@thurj.org with questions or compliments.